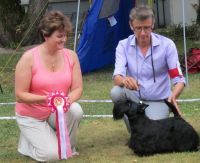 This year I celebrate being owned by Scotties for 25 years, I bought my first Scottie Mayson Felicity (Fliss) in 1992 from John & Susan Gaskell, she became the foundation of my kennel and all of my present day Scotties descend from her. My first Scottie litter was born in the summer of 1995, Fliss self whelped a litter of 10 puppies, it was a hot summer that year & I have many wonderful memories of watching my babies play & grow, the whole experience of a heavily pregnant mum to be & the joy of those babies was the inspiration for my affix, Scotties sitting in the shade of the berry bushes with a warm breeze blowing through their eyebrows, what could be more natural or pleasing to my soul, I felt truly blessed. To date I have had the pleasure of breeding 7 UK Champions, Ch Berrybreeze Fire Cracker, Ch B Ilumination, Ch B Reckless Eric, Ch B Supertramp, Ch B Dizzee Rascal, Ch B Glad All Over & Ch B Jubilation, plus many overseas Champions. 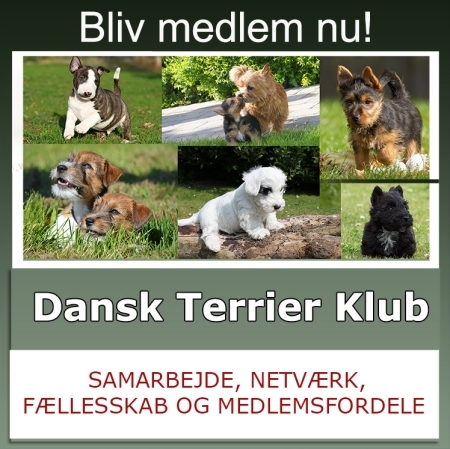 My first time awarding Challenge Certificates was at Windsor Championship show in 2009, followed by Scottish Terrier Club Scotland in 2011, North of England Scottish Terrier Club in 2014, I also Judged at the Scottish Terrier Club of Finland Specialty Show in 2014, I am very much looking forward to Judging in Denmark in 2017 and consider it a great honour to have been asked to judge your show on such a special anniversary year for our breed in Denmark, I am very much looking forward to enjoying the celebrations with you all.